e.g. After I had had to do my homework, I went for a walk. Of course, English speakers are likely to make contractions: I'd had to, etc. J'avais dû en racheter un nouveau après que Patrick avait cassé le mien. I'd had to buy a new one after Patrick had broken mine. Tu avais dû le licencier finalement. You'd had to let him go in the end. Si elle avait dû le faire, vous auriez eu des problèmes. If she'd had to do it, you would have been in trouble. We'd had to clean the house before my parents saw the mess. Si vous aviez dû, l'auriez-vous fait? If you'd had to, would you have done it? Elles avaient dû repasser l'examen, après qu'elles avaient échoué les trois premières fois! They'd had to take the exam again, after they'd failed the first three times! J’avais dû en racheter un nouveau après que Patrick avait cassé le mien. This sentence is an example from the lesson. Here, plus-que-parfait has been used in both the verbs. Though the action of breaking took place first and then came the necessity to buy a new one. Would you like to explain how these two cases can be both Le plus-que-parfait ? I guess the answer is that by using the word "après", we are explicitly indicating that one of those actions happened before the other one (although they both happened in the past). So if one action precedes the other , then one action should be in Passé Composé and other in Plus-que-Parfait ? I hope a native expert will help. No-one would use " They had had to retake the exam," in written or spoken English. One would possibly say "They'd had to retake the exam", but the simplest form "They had to retake the exam", is the commonest usage. Hi Alan We do use the pluperfect form in English when referring to events further back in time than a time in the past already referred to (usually when relating a story, verbally or in writing). We try to keep the questions short and so that extra context may not be apparent here so I understand why you'd suggest "they had to" but it isn't equivalent. The example would make more sense in a wider context, and so it does feel contrived because that's missing. E.g. consider: "It was revealed that they had had to retake the exam." This has a very different nuance to: "It was revealed that they had to retake the exam." This example is also complicated slightly by the fact the verb is "have to" and so you have the auxiliary "had" (needed to form the pluperfect) along with the past of "have to" which can get a little clunky. I understand what you say but whilst the use of " had had" may be grammatically correct it just isn't said. Consider; "They had to retake the exam because they needed a pass to attend university", compared with "They had had to retake the exam because they needed a pass to attend university". There is perhaps a slight difference in meaning in that the latter suggests some compulsion but the sense is the same and the former is more elegant which is why everyone I have asked would use it. Bonjour Alan ! I agree that you will more commonly use "I'd had" (which is simply the contracted form of had had) or even simply "I had", though the second one is losing the anteriority contained in the use of the Pluperfect = I'd had took place before I had :) I've now updated the example to "I'd had" :) Merci et à bientôt ! I would use it. For example "I had had to retake the exam twice before I could apply for the course. Or "I had already had to retake the driving test twice before I bought my car". This site could really be improved of the examples were reworked to make sense in both British and American English. Americans rarely use the pluperfect, and often use a time marker like "before" to avoid having to use it. Many of us don't contract "had had" with " 'd had" since the only time we use that tense in the first place is for emphasis. The second examples you gave are things that would get used in AmE, whereas the examples in the lesson are so odd as to be barely comprehensible. The lesson is not odd. I am English. Before my retirement I was a teacher and taught English grammar for many years. The pluperfect may not be used often, in English, but it is grammatically correct, a valid tense (as in French) and is good English. American English is a different language. It would be impossible for the site to provide for the differences between American and English English. As Aurelie said, in spoken English it would have been "I'd had...." with the apostrophe replacing the "ha" in had, but it still means "I had had....."
It's true that there are differences between American English and British English, but I don't think this is one of them. I'm a native speaker of American English and the pluperfect in that language feels perfectly natural to me, both in speech and on the page. Besides if it's used in French, we want to learn it, don't we? Je ne comprends pas le mot "vissent" dans la phrase "Nous avions dû nettoyer la maison avant que mes parents ne vissent le désordre." Je pensais que ce serait le subjonctif du verbe "voir" mais je l'ai trouvé sous le mot "visser". Bonjour Greta ! 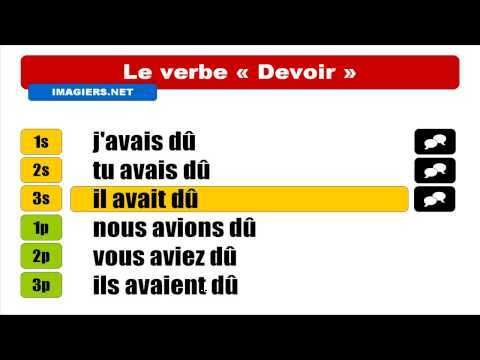 It is indeed the verb "voir" in Le Subjonctif Imparfait, which is used very rarely nowadays but perfectly correct in this sentence, regarding the Sequence of tenses. However, people would tend to use Le Subjonctif Présent nowadays, as such: "Nous avions dû nettoyer la maison avant que mes parents ne VOIENT le désordre." Both sentences are perfectly valid :) I hope that's helpful! À bientôt !